Tuberculous meningitis is the most severe form of tuberculous infection (Mycobacterium tuberculosis) and presents as a subacute syndrome with lymphocytic pleocytosis and low glucose in the cerebrospinal fluid (CSF) and meningeal enhancement of the basal cisterns and hydrocephalus on neuroimaging. Diagnosis is challenging, since CSF cultures take long and are positive in less than two-thirds of patients. Empirical therapy is thus often employed. Mortality rate of this infection remains at approximately 25 % of the patients. Parenchymal involvement (tuberculomas and spinal cord damage) may also appear. Nontuberculous mycobacteria affect AIDS patients. M. avium complex is most frequently implicated. 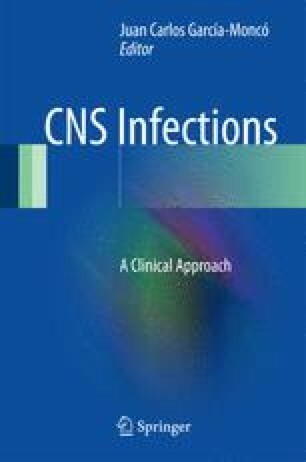 CNS infection is rare and occurs with disseminated disease. Diagnosis is made by culture of involved tissues, and therapy requires a prolonged, multidrug regimen.